Rupert Neve Designs is pleased to offer you the chance to test drive our new 8 channel microphone preamp, the RMP-D8. 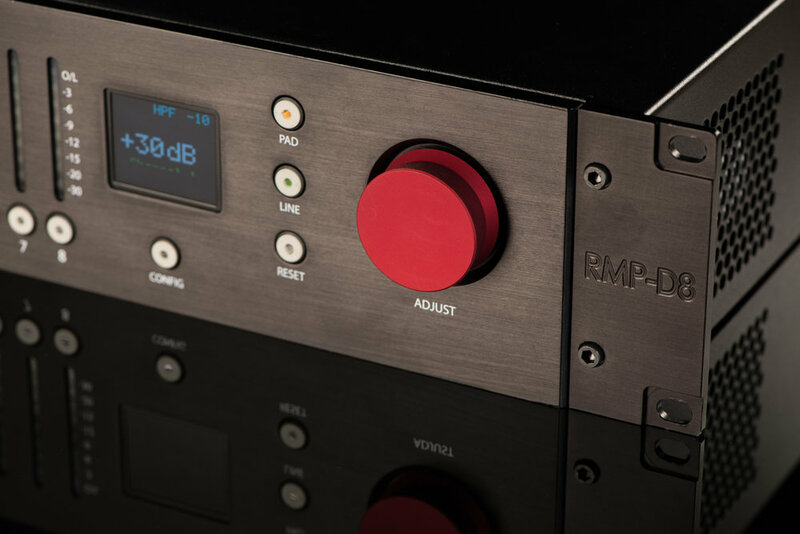 The RMP-D8 is a Dante-enabled remotely-controllable mic pre that will instantly upgrade any digital console system to the rich, bold sound for which Rupert Neve is renowned. Each of its eight channels contains a fully-realized class-A microphone preamplifier coupled to a custom Rupert Neve Designs audio transformer, which feeds signal to our mastering-grade 24-bit/192kHz converters out to your Dante-networked audio system. The RMP-D8 finally offers the live sound, install & broadcast worlds something that studios have always coveted: the classic sound of Rupert Neve Designs. As a bonus for Yamaha console owners, with the new Version 5.0 firmware on your CL or QL console, the RMP-D8 can be controlled and recalled directly from the desk. If you quality for the program, someone will contact you confirming receipt and next steps. Please note: due to the volume of submissions, we cannot guarantee a demo unit for all requests. After the above, you will then be put on the wait list for a RMP-D8 demo unit. Please understand that there are a limited number of units available - so if your request is granted, a wait time may be required, and we may not always be able to accommodate specifically-requested demo dates. When a demo unit becomes available, we will contact you, ask you for credit card information (purely for security purposes; your card will not be charged) and ship the unit. After receipt, you’ll have about 10 days to demo it before a UPS call tag is sent for pickup. If you decide to purchase, an authorized reseller will contact you with details. By clicking “Submit”, you are agreeing to receive communications from us and/or our authorized resellers regarding the RMP-D8 demo program and potential purchase. Your personal information will be kept secure, and will not be used for any other purposes. Please choose one category that best represents you. Thank you for your interest in the RMP-D8! If we have an RMP-D8 demo unit available for you, someone from our team will be in touch when possible. Learn more about the RMP-D8 here.